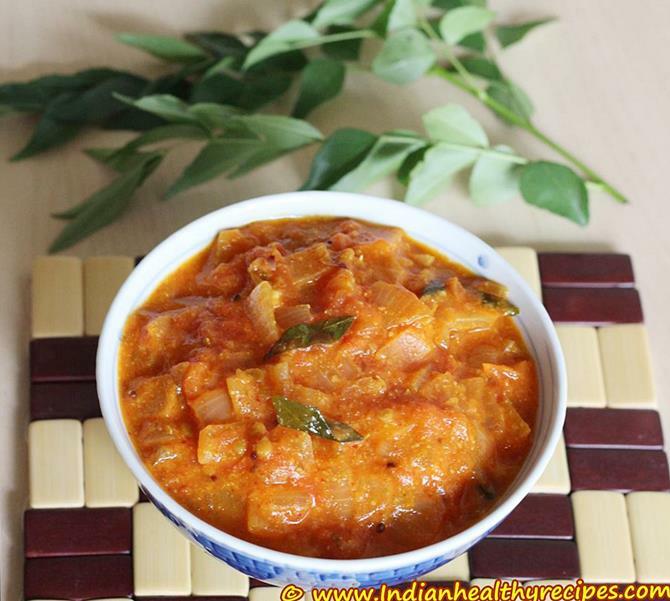 Tomato curry recipe – One of the simplest of the tomato recipes from Indian cuisine. Onion and tomatoes form the base of our Indian curries, we generally use them to make any curry and top up with the main vegetable like drumstick, ladies finger, cauliflower etc. But using only tomatoes and onions we can make a great tasting curry. 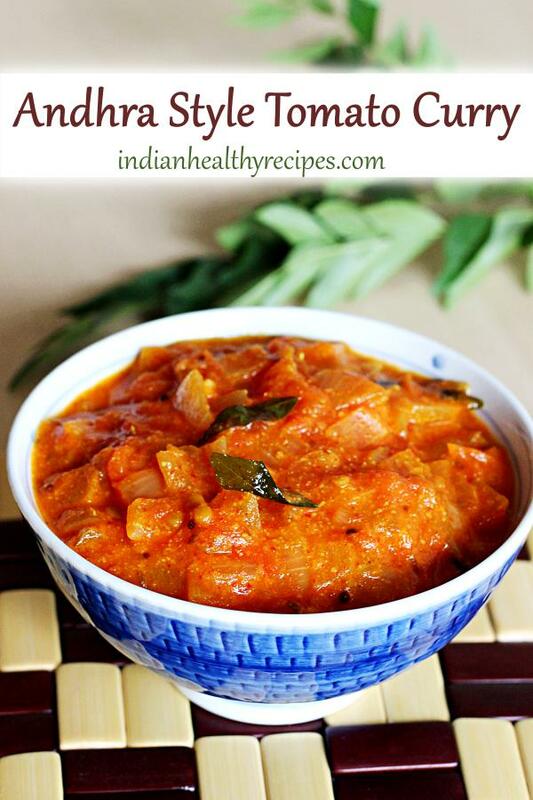 I am sharing an easy and simple tomato curry recipe that can be prepared even by a beginner. This recipe needs no ginger garlic, no garam masala, yet it tastes great and is finger licking with a nutty taste. 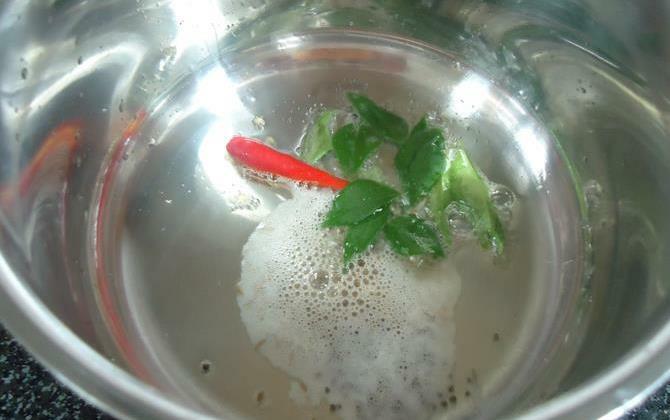 It is a traditional way of preparing a curry in the coastal regions of Andhra Pradesh. There are other versions too, but this is the one I like and often cook. It goes well with steamed rice, chapathi or even poori. 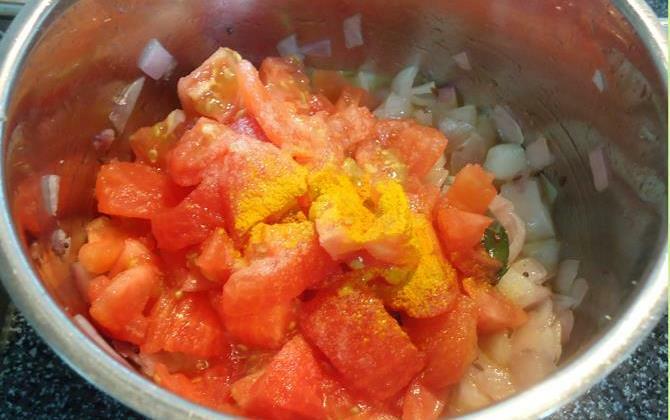 I generally don’t like to blend or grind tomatoes & onions except for the North Indian dishes. But if you don’t like to see the seeds of tomatoes in the curry, then you will have to discard them and use. To make tomato curry, I have boiled the tomatoes for 3 to 4 minutes so that the skin can be removed easily. This is however optional. 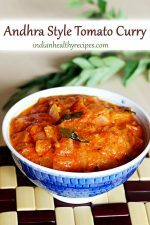 Simple andhra style tomato curry made with onion, tomatoes & spices. This tomato curry goes great with rice , chapati or paratha. 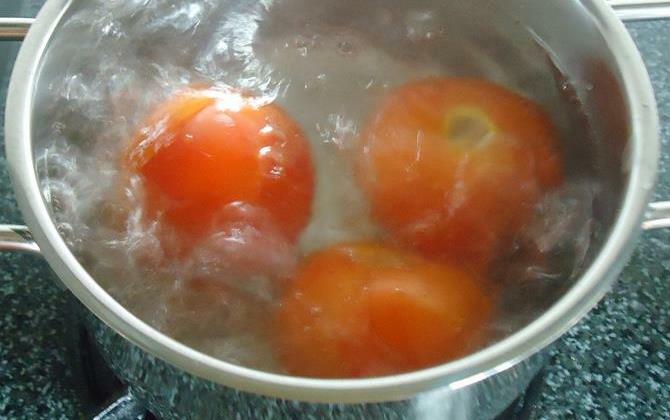 Optional step: Boil tomatoes for 3 to 4 minutes in 2 cups water. This will loosen the skin. Once cool, remove the skin and discard. Discard the core as well and chop the tomatoes. Toast the sesame seeds on a low flame until aromatic and make a fine powder. If you do not have sesame, replace with almonds or peanuts or fried gram. Set this aside. Add oil to a pan and heat it. Add cumin and mustard, when they begin to sizzle add curry leaves, green chili and hing. Next add chopped onions, salt and fry lightly till they turn pink. Add the chopped tomatoes, turmeric. Fry for about 3 to 4 minutes. You can cook covered till the tomatoes turn soft and mushy. Next add red chili powder, sesame seeds powder or fried gram powder. 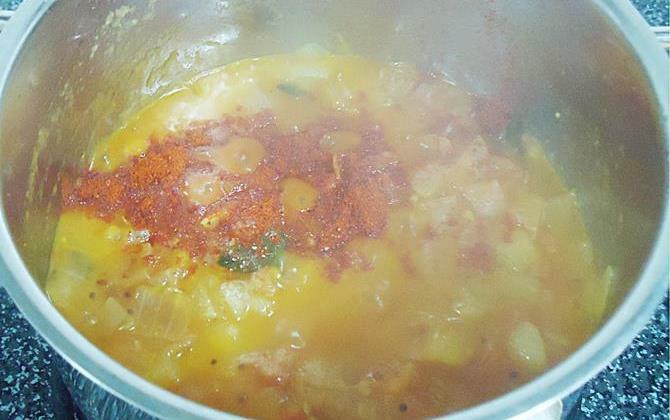 Mix and cook for one to two minutes until the curry turns thick. Taste the tomato curry and add more salt if needed. Add coconut milk and stir. 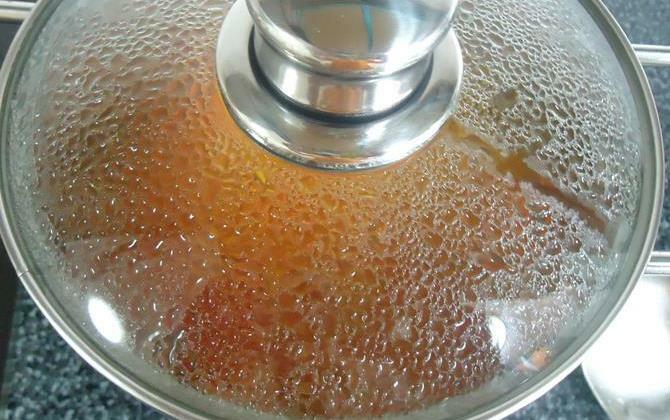 When the tomato curry begins to bubble up, switch off the stove. 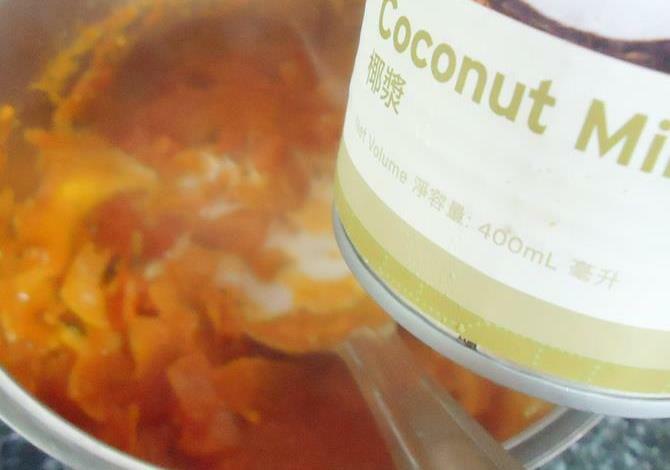 Cooking for longer may coagulate the coconut milk. 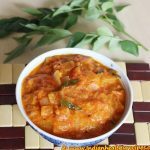 Serve tomato curry with rice & ghee or with roti. Coconut milk: If you do not have coconut milk, just omit it. But the taste will be of a normal curry. This recipe needs only thick coconut milk. Do not use thin coconut milk as you will not get the flavor. Sesame seeds: Traditionally white sesame seed powder is used but if you do not have you can use almonds or fried gram or even peanut powder. 1. This step is optional. Wash and boil whole tomatoes in enough water to loosen the skin. This takes around 3 to 4 mins. But depends on the kind of tomatoes. 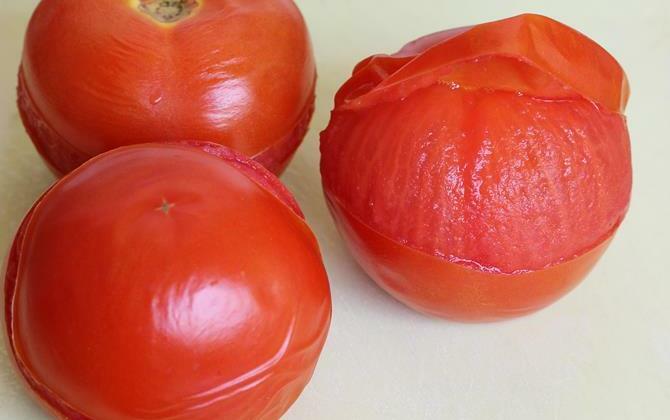 While boiling just pick up one tomato with a spoon and check if the skin looks loose. 2. Peel of the skin and discard. Chop tomatoes to small, remove the core from the center. 3. Toast sesame seeds and make a fine powder. Set aside. 4. Heat a pan with oil, add mustard cumin, curry leaves and green chili. When they splutter add hing. 5. 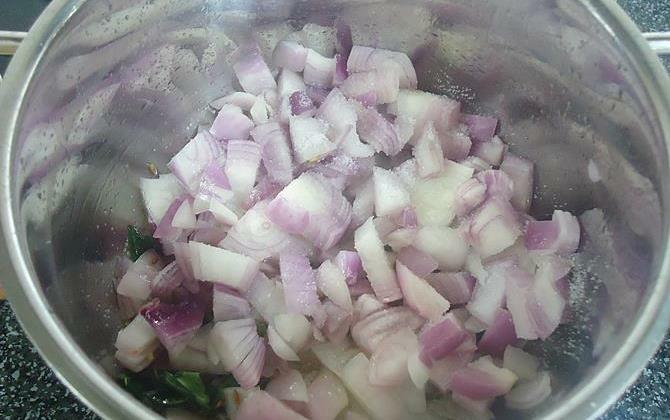 Add onions, sprinkle salt and fry till they turn slightly pink not golden. Takes only 1 to 2 mins. Do not brown the onions. 6. Add chopped tomatoes, turmeric, fry for 3 to 4 minutes. 7. 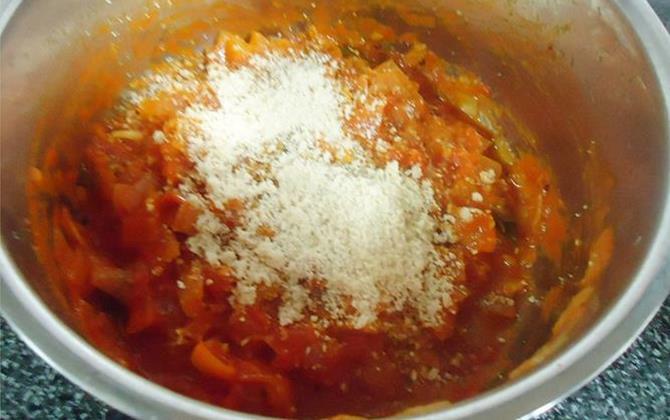 Cover and cook till the tomatoes turn fully mushy and soft. 8. Add red chili powder, adjust salt and fry for a min or 2. 9. Add fried gram powder or sesame seed powder. Mix and cook for a min. 10. Pour coconut milk. Mix well. Simmer for a min or 2. Off the heat. Do not cook for long else the coconut milk may coagulate. Tomato curry is ready to serve. Serve hot with ghee and rice or roti. I just made this for my wife (but a bachelor could do it ? ). Delicious! I doubled all the spices because a) we do not have very good spices and b) we LIKE spices. Thank you so much.